"It took me four months to write CONAN. I had been hired to write the first draft. Paramount and Edward R. Pressman had told me to go ahead without restraining myself. I was expecting they would ask for a more digest, second draft. But I never had the chance to write it: Paramount cancelled the project. [To write the script,] I read each book, each comic book. Robert E. Howard was a strange bird from Texas. He wrote all these great stories, originally in pulp magazines. He had a great gift for this perverted mythos of darkness and death, raging and mad Wagnerian mentality. [John Milius said that my script was a “feverish dream under acid”] but it is exactly what the film should have been! It is what arises from the work of Howard. He was a very strange man. He died very young. What Edgar Rice Burroughs had made a success of with Tarzan, Howard renewed with Conan, who is a kind of post-modern Tarzan, less noble but more mischievous. He knew moreover to confer a science-fictional quality on his stories, whereas they are held in the past. In the novels of Howard, there is no more barrier between the past and the future, and it is for that that, in my script, I made the same kind of outward journeys and returns, suggesting thus that all that the spectator saw could occur very well in the future. Conan is the kind of character that I can write. He became myself. I identified myself with Conan, the same way I identified myself with Jon Lansdale in THE HAND or with Billy Hayes in MIDNIGHT EXPRESS. Because of the degree of suffering in each one of them. Because of the things they drew from themselves during serious circumstances. In THE HAND, the main character is also an anti-hero, since he ends up becoming a killer. But as a former artist of Marvel Comics, you find him sympathetic. Conan applies well to this idea. All his reactions are perfectly natural. He cannot lie. But he can steal on the other hand. For that, he is terrible! He is this man, large, naked, who wanders in the city. He takes what he wants when he wants it. [He is the man which one would like to be in certain situations.] One would like to be able to botch his enemies, to destroy them. Conan does it. Howard really created a completely coherent mythology. One could easily draw ten films from it. If Dino De Laurentiis had not been so scanty, he could certainly have made a great series of it, but he impoverished the scripts. The first draft I wrote, I always undertook it as one of twelve. I always thought there would be twelve movies! But, unfortunately, I feel the producers of the movie misunderstood the real gold and they sold it short. Arnold [Schwarzenegger] should have come back every year or two years like James Bond, and done one. Conan is the classical story by excellence. I much liked the idea that he had been a slave, had suffered and managed to rise. What is great in the Howard's novels is that Conan passes from the stage of peasant to that of a king. A young peasant gains his royalty through a series of tests and marry with one of the most beautiful society women. In my script, which concentrates several stories of Howard, Conan saves the life of one princess to whom one stole his kingdom. At the end of the film, after having reconquered her throne thanks to his assistance, she offers her hand in marriage to him so that he becomes king. But Conan refuses this honor. He indeed considers not to have still traversed sufficient way to reach such a load. He tells her: "I can't be a king this way, as your husband. I can't inherit the throne. I will earn my throne." So, he leaves her, like Charles Bronson or Clint Eastwood at the end of their westerns, with the sunset in the background. And he goes riding off to the second adventure, which was supposed to be the follow-up sequel. If they'd done it my way, they would have had a Bond-type series, 12-13 pictures, which is what I had wanted to do. It really was a formidable story, very mythical, the one of a young foreigner who makes the Good and who gets to the top of the pyramid. I could not have made CONAN: it was a too big, much debated and very politicized project. At the time, the average budget of a movie in Hollywood was $8 million and I was more confortable with working on lower budgets. I do not like the studios policy. They try to say to you what you must do, they do not pay attention to what you want to make. My problem is that I write ambitious scripts that require big budgets to be filmed. And, for CONAN, I had let myself be carried away. My original draft was a $40 million movie. It dealt with the takeover of the planet and the forces of life being threatened by the forces of darkness. The mutant armies were taking over, and Conan was the lonely pagan - as opposed to Christian - hero; he was Roland at the pass, he was Tarzan, he was a mythic figure. I had put lots of mutants, lots of beasts-men. At the time, I already was interested in the cloning, in DNA, this kind of things... It made sense. I had lots of images in my head, armies of 400 or 500 mutants charging at each other! But I never could carry out this vision in the form of a film. I wrote these scenes [in which all these demonic creatures appear, as well as Thulsa Doom] by attentively looking at the Jerome Bosch paintings. It should be said that at the time I wanted to direct the film and that, if the reins had been given to me, I would have really switched it on a concept mixing mutant and animals, heaven and hell. I was very influenced at this time by a whole imagery resulting from Catholicism. By William Blake's poetry too. I would have shot the film in a luxuriant forest of Germany and I would have shown creatures eating human flesh. This is what this film should have been. As for Thulsa Doom, he had absolutely nothing to do with the character played by James Earl Jones in the Milius version. [Ridley Scott withdrew from the project at the last minute.] I thought that he had made this decision with enormous detachment. Scott is a man of difficult access. It is almost impossible to know what he thinks. He speaks little. Taking into consideration conversations which we had together, an obviousness was however essential: he perfectly understood the CONAN THE BARBARIAN universe... Perhaps then was he frightened by the script? It is true also that he was offered BLADE RUNNER at the same time, and that had certainly an influence on his decision. Adapted from : Mediascene Prevue #43 (November/December 1980), Film Comment (January 1987), "Le petit livre de Oliver Stone", by Gilles Boulenger (1997, Le Cinephage) and CONAN UNCHAINED (2000), by Laurent Bouzereau. 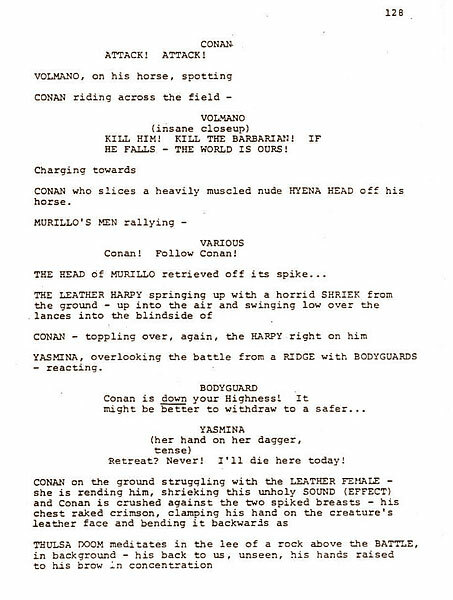 - "THE CONAN THAT NEVER WAS": A very interesting comparison between the script of Stone and the film of Milius. - One (only) page extracted from the script of Stone (while waiting for a good soul to put all the rest online!). UPDATE: Donwload the whole script here! - Some small precisions from Jim Danforth (stop-animation specialist, and author of the matte-painting of the penultimate shot of the Milius film): “To set the record straight about CONAN: It was not originally a Dino de Laurentiis film; it was solely an Edward Pressman production, with a screenplay by Oliver Stone. That production fell apart and was revived when Dino de Laurentiis came on board. At that point Rick Baker walked, and I and several others were not carried across to the new version. The Oliver Stone script had a multi-headed dog, an artificial three or four foot tall female harpy-like 'construct', the small bat-like creatures of the Hyperboreans, an enormous creature (of which we see only a gigantic tentacle), robot-like mechanical warriors, a giant snake, and a snake-headed woman (whose snakeiness can be seen only in a mirror). Those were the stop-motion creatures: there were others, like Brak, that would have been make-up done by Rick Baker. There would also have been a number of matte paintings of the cities."